Dili is the name of one of the 13 districts of East Timor, which includes the national capital Dili. The district is identical to that of the same in Portuguese Timor, with the only difference that it used to include the municipality (today district) of Aileu. 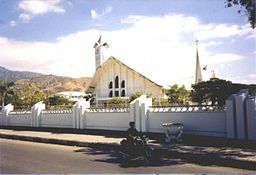 Dili is the smallest district in East Timor, but it has the highest population. It is the economic and political centre of East Timor. The district of Dili, with 368.12 km2 (142.13 sq mi), is the smallest district of the country; it lies on the north coast of the island of Timor on the Savu Sea. It borders the districts of Manatuto to the east, Aileu to the south, Liquiçá to the west and the Savu Sea to the north. Atauro Island, 30 km (19 mi) to the north of the district opposite the capital, is one of its subdistricts. The district is divided in six subdistricts: Atauro, Cristo Rei, Dom Aleixo, Metinaro, Nain Feto and Vera Cruz. The capital of the district is Dili and the administrative headquarters of the district are located in Caicoli, in the subdistrict of Vera Cruz. The city of Dili extends over several subdistricts. Other settlements in the district are Dar (subdistrict Veracruz), Hera (Cristo Rei) and Metinaro (Metinaro). Mountains are close to the coast so that most of the landscape is mountainous. Near the western border is the Lake Tibar, one of the few large lakes of East Timor. Three small lakes with salt water are near Tasitolu and they have been named as Important Bird Area and also the entire island of Atauro. The climate of Dili is typical of the north coast of East Timor. In the dry season, the temperature could get up to about 35 °C (95 °F); at night, the temperature is around 20 °C (68 °F). In the rainy season the temperature is around 27 °C (81 °F). The annual average is 26.7 °C (80.1 °F). Rain falls almost exclusively during the rainy season from late November to April. The average annual rainfall is 1,000 mm (39 in). The district of Dili had a population of 245,873 in 2011, more than in any other district in the country. Its density is 667.9 inhabitants per km², the greatest in East Timor. Tetum, the official language, is the dominant language on the coast where the dialect Tetum Praça (a dialect with a great influence from Portuguese) is spoken; in the interior of the district and in Metinaro, the national language Mambai is often spoken. ↑ 1.0 1.1 "2010 Census Wall Chart (English)" (pdf). Direcção Nacional de Estatística. Retrieved 15 September 2013. ↑ 2.0 2.1 "Timor-Leste in figures 2011" (pdf). Direcção Nacional de Estatística. Retrieved 15 September 2013. ↑ "Administrative Division". Government of Timor-Leste. Retrieved 17 September 2013. ↑ "East Timor Languages". East Timor Government. Retrieved 17 September 2013. Wikimedia Commons has media related to Dili (District). This page was last changed on 3 August 2017, at 15:56.